WHEN the illiterate farmer Kasper Schisler breached the cordon and managed to sneak into the little village in the Bavarian Alps from which he had been banished in the 1630s, he set off an extraordinary chain of events that to this day attracts hundreds of thousands of people to the place that he could have single-handedly wiped out. In places, villages reported sixty per cent or more of their populations wiped within days of the arrival of the agonising Black Death. And so fast-spreading and devastating was it, that body was piled above body in mass graves without so much as a church service for individual unfortunates. Kasper Schisler lived in the tiny village of Oberammergau in Bavaria's picturesque Ammer Valley, and on an otherwise normal day in 1632, bade farewell as always to his wife and children and headed off to the fields to work the crops that fed his family and were sold at market. But this day turned out to be anything but normal: while many of Oberammergau's farmers were out in their paddocks, word reached the village Elders that the dreaded Plague – of which they were all well aware – had struck at neighbouring Eschenlohe, just 4km away. In a week, two-thirds of Eschenlohe's population was dead. Oberammergau's Elders acted swiftly, banning anyone entering their village including those unfortunate farmers working their plots: when Mr Schisler tried to return to his home, hastily thrown-together "village protection teams" blocked his way, telling he and others to return to their mountain paddocks and fend for themselves until fear of bringing The Plague with them passed. Oberammergau's hasty security screen appeared a success: no-one succumbed to The Black Death, although by now it had leap-frogged over the village and was causing devastation in others to the north, south, east and west. But a homesick Kasper Schisler reckoned that on the day his village would hold its annual celebrations commemorating the consecration of its church, guards too would be celebrating and therefore at a minimum, so he could sneak back home for a quick conjugal visit. He was right, and was able to steal safely back to his family. But it was with fatal results: next morning he was feverish and within three days was dead – he had brought The Plague with him, and within a fortnight his wife, children and close friends who had concealed him had all died. The Elders ordered that homes of all others showing signs of The Plague be boarded-up, their occupants incarcerated inside until they died. Then the Elders suddenly did a strange thing: in July of 1633 they led the whole village to the Parish Church, including the sick afflicted by The Black Death whom they'd released from their boarded-up home-prisons. Inside, these Elders enjoined the entire congregation to swear a sacred vow on their Bibles: if God spared their village of any further deaths they would perform a Passion Play every ten years recalling the "the Life, Suffering, Death and Resurrection of Our Lord Jesus Christ." Remarkably, not another soul died of The Plague in Oberammergau – including even the already afflicted – although it continued its grim journey through Europe, and eventually even reached England. True to their word the Oberammergauers performed their first Passion Play in 1634 on a stage in a cemetery above the graves of Plague victims, and apart from three occasions it has been held every ten years since, with the next due in 2010. 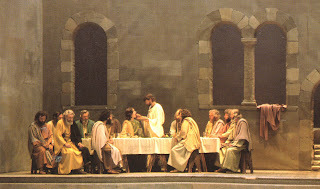 The Play runs 7-hours including a meal break and is performed almost daily over five months; more than 2000 villagers – a third of the population – become temporary actors, musicians, stagehands, technicians, choristers and participants in tableaux vivants – motionless depictions of scenes from the Old Testament. 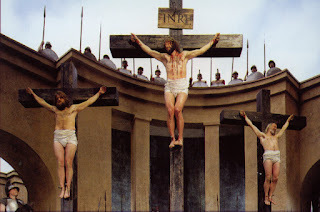 And their Passion Play attracts half a million international visitors: travel company Far Horizons has a 26-day escorted tour through Germany, Slovenia, Croatia and Herzegovina in September 2010 that includes a stay in Oberammergau and the Passion Play.
. TRUE to their word, 375-years Oberammergauers still play out the Passion of Christ.